Perhaps inspired by the accurate 2012 election predictions and winning tactics which were based on demographics, we decided to analyze the life science industry using geographical data from LinkedIn. Using the LinkedIn advertising application, we’ve mapped 3 million U.S. professionals in biotechnology, pharmaceuticals, and medical devices, and their distribution defines geographical life science hubs. While the overall results fit with recent reports ranking the regions, the segmentation of each life science hub sheds light on the characteristics of each area. Every member of LinkedIn must designate an industry and a location. While it is not known how many users designate only their country, my own anecdotal evidence indicates that this is a small minority and that most choose their city. Through the LinkedIn advertising interface (see image on right), we painstakingly tabulated the number of users in each U.S. city who designated their industry as biotechnology, pharmaceuticals, or medical devices. These figures, while not perfect, are a good representation of people who are working in the life sciences industry in these regions. The numbers will be dependent upon the utilization of LinkedIn by life science researchers and professionals in a region, and thus may vary. Anecdotally, I have met very few people who research or work in life science who are not on LinkedIn (and you could argue that I meet mostly network savvy individuals). Regardless of the validity of the raw numbers, comparisons between regions should ring true. You can view the data here and we used the public version of Tableau visualization software to graph the data by city and state. Mouse over any item in the graph to get the data supporting it. On a desktop computer, mouse over the left top and see controls for zooming and choosing an area to zoom. Reset the map using the ‘Revert all’ menu item (looks like refresh) at the bottom middle. On an iPad, just use finger pinches to zoom. Choose one data set to view exclusively on the map using the menu on the right. For example, left click on ‘Biotechnology’ and it becomes highlighted. Mouse over it and choose ‘Keep Only’ to see the map or graph change. Use the export menu at the bottom (square with arrow) to view or save an image, PDF, or the data. A few caveats about the graph above and below. 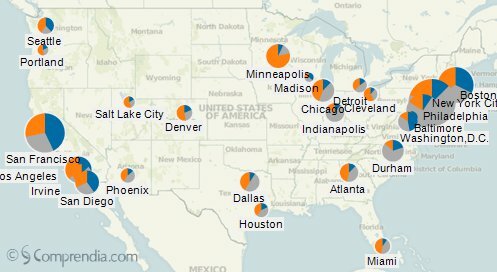 We collected data on every city for which we could find data for each life science area (some are too small for LinkedIn to provide values). The LinkedIn Ad interface does not segment New Jersey, so we couldn’t include any cities in that state. We did an analysis of each state for this reason and it is shown near the bottom of this post. LinkedIn groups Orange County, California as one region, but we had to list a city for the geographic coding to work, so we chose Irvine. New York City, Boston, San Francisco, and Philadelphia are the top cities when all life science disciplines are considered. However, one must remember larger cities will have a larger number of patient-facing professionals, and the numbers may be partly skewed because of this fact. When considering only biotechnology (use tip #3 above in the graph below), San Francisco, Boston, New York City, and San Diego are the top cities. Boston, San Francisco, and San Diego are almost equally partitioned between the three life science areas, while New York City and Philadelphia are heavily biased towards pharmaceuticals. Interestingly, San Francisco and Boston have equal amounts of medical device and pharmaceutical professionals, with San Francisco ‘beating’ Boston in the biotechnology area. In Southern California, note that San Diego, Los Angeles, and Orange County form a ‘macro hub’ which is sometimes ‘gets no respect‘ from the life science pundits (if we can call them that). Determining what regions are ‘hubs’ and the reasons for designations is complicated, you can look at an in depth report for more information. As mentioned above, we did an analysis by state to show some aspects that weren’t obvious from the city analysis. 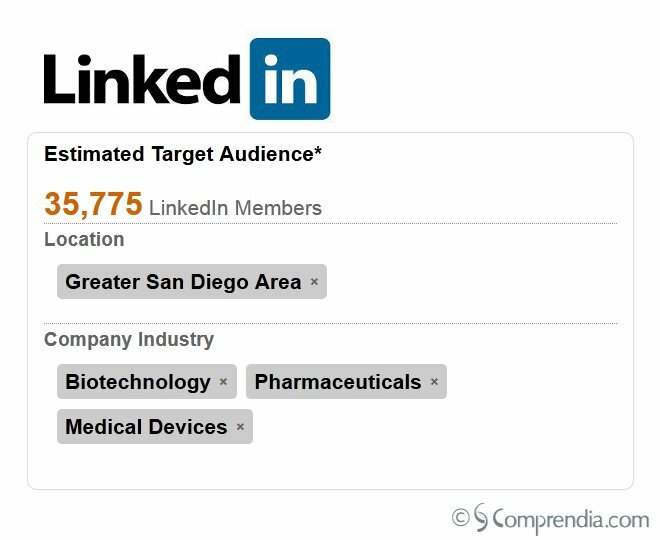 Again, we looked at biotechnology, pharmaceuticals, and medical device categories in the LinkedIn Ads application. Pennsylvania, Massachusetts, Connecticut, and New Jersey were the top states for life science LinkedIn members, with California in fifth place. We have not yet segmented these results but suspect that California would fare better in the biotechnology sector. Although I’m tempted, I will eschew using the ‘special math‘ used on Fox News on the 2012 election day and declare that, for now, the east coast life science hubs have a size advantage over those on the west coast. Some could argue that the west coast, being more focused on life science discovery rather than development and treatment, has been negatively affected by the dearth of venture capital funding and related IPOs over the past few years, and that our numbers will be increasing soon. Also, there is no arbitrary rule that the two coasts should be in competition…but it does make it more interesting! If you gleaned any insights from these graphs and data, please leave them below, we’d be interested in hearing them.